Stabilizing selection is a form of natural selection where the average individuals within a population are favored and proliferate as the environment selects against individuals with extreme phenotypes or mutations. In contrast to other forms of adaptation, where adaptations and mutations can help an organism outcompete others of its species, this form of natural selection favors those in the population’s majority, which are already adapted to the environment they are in. Let’s take a deeper dive into stabilizing selection, look at some examples, and see how it compares to other forms of natural selection. Natural selection is the process by which evolution occurs, making a species evolve into a different species through a gradual process that takes place over the course of many generations. There are at least a few different forms of natural selection. Stabilizing selection contrasts itself against two other forms of natural selection: directional selection and disruptive selection. Phenotypes are the observable characteristics in a species, and when a population of organisms experiences a change in their phenotype it will generally be subjected to one of the three different types of selection. Directional selection is natural selection that favors organisms found on the extreme end of any given set of traits within a population. In other words, the environment favors the individuals who possess the extreme phenotype and over time the population will shift so that the majority of the population has the extreme phenotype and few individuals with the moderate phenotype remain. An example of directional selection is Darwin’s finches, which saw their beaks change as food sources shifted. Finches with larger beaks were better equipped to crack seeds when insects were lacking, and the population trended toward individuals with larger, deeper breaks. When insects became plentiful again, the opposite happened. Meanwhile, disruptive selection favors individuals that have an extreme form of a trait over the individuals with intermediate forms, which can give rise to two different groups/populations of an organism. 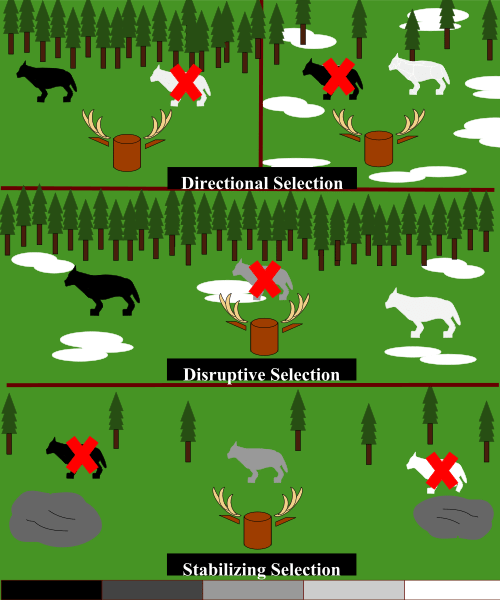 The likelihood that disruptive selection will occur is based on different variables found within the interactions between a species and its habitat, such as types of isolation. Over time, a population will be created that is predominantly made out of individuals with one of the two different phenotypes but with very few individuals with an intermediate form of the phenotypes. An example of directional selection is the peppered moths of London. Moths that were darker in color survived better in London by blending in with the soot-covered, polluted surroundings. Meanwhile, moths found in rural areas were predominantly light in coloration. There were very few medium colored moths left after disruptive selection occurred, with most moths dark (in the city) or light (in the countryside). Stabilizing selection is effectively the opposite of disruptive selection, in that instead of favoring individuals with extreme forms of a trait it favors the majority of the population that already has the intermediate/moderate form of the trait. Stabilizing selection “stabilizes” a population by making the intermediate trait the most commonly expressed version of the trait, allowing its propagation over mutated forms of the trait. Over time, the majority of the population that has the intermediate form of the trait will consume a larger and larger percentage of the trait distribution in the population, while individuals with extreme forms of the trait will become less common. If you were to graph the distribution of a population under stabilizing selection pressures, you would have a modified bell curve that is slightly taller and thinner than a normal bell curve. Stabilizing selection is arguably the most common method of natural selection that occurs in plants and animals, as it essentially just reinforces the traits of animal populations that are already well adapted to that environment, rewarding organisms that have reliable, enduring phenotypes. On the other hand, stabilizing selection ends up driving down a population’s genetic diversity. The disappearance of individuals with extreme phenotypes also means an associated loss of alleles and genes responsible for these phenotypes. Because of this effect, the forms/functions associated with phenotypic traits of an organism can endure for extremely long time periods. Consider how sharks have barely changed in millions of years. Stabilizing selection usually occurs in phenotypic traits which are polygenic, coded for by multiple genes. As mentioned, a graph of a population undergoing stabilizing selection will appear taller and narrower than a normal bell curve. The reason for this distribution can be appreciated by looking at the example of hair color within rats. A species of rat that has lived within a dense forest would have to try and blend into the forest floor with fallen branches, twigs, and leaves. 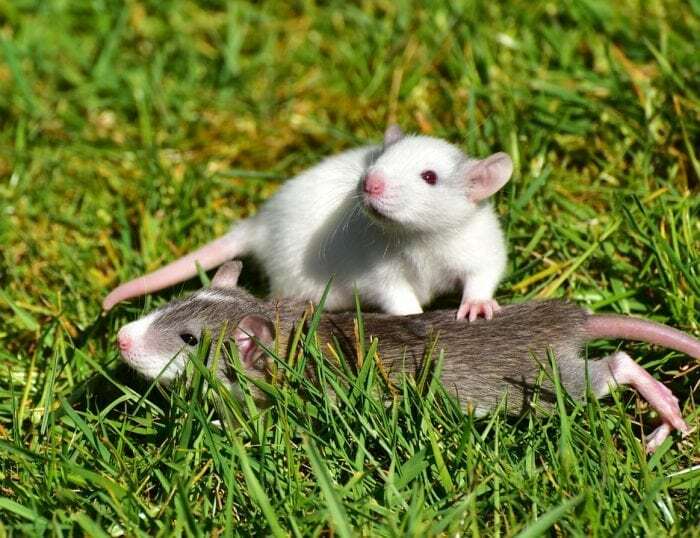 Rats with light coats won’t be able to blend into the brown forest floor, and rats with black coats will have a similar problem. The rats with medium brown coats will be able to blend in better with the forest floor. Eventually, a decline in rats with dark or light colored fur would occur, leaving most of the rats in the area with medium-brown coats. One of the most famous examples of a species with stabilizing selection is humans. If the birth weight of a human is too low, it will have difficulty surviving after birth. On the other hand, a baby weighing too much would create complications for both the mother and the child. In these scenarios, the middle ranges are the optimal birth rate. The size of a clutch of eggs that birds lay is limited to a certain amount of eggs that helps guarantee maximum survival rates. Too many chicks mean too many mouths to feed, burdening both the parents and the many chicks. Yet too few children mean that disease or predation could easily wipe out the whole batch of chicks, severely reducing the chance that genes will be passed onto the next generation. Stabilizing selection is also witnessed in plants, where the medium height of a plant is the preferred height. Plants that grow too tall expend extra energy to do so and can get damaged from wind. Meanwhile, plants that are too short may not get the sunlight they need to grow and spread. Previous Post« Previous What Is Diffusion?